We here at Mainstream Fiber Networks hope you all had a Happy Halloween, despite the weather. Last night, for the second year, Mainstream Fiber took part in Harrison County’s Trick or Treat at the Track event, where over 1000 kids and parents braved the rain to trick or treat. It was a great event full of great costumes and great people, not to mention over 1000 lit Jack-O-Lanterns! It was an incredibly fun event, and we’re all looking forward to be a part of it again next year! In the meantime, we hope that you all enjoy the rest of your fall and the start of this new month! Mainstream Fiber Networks is proud to announce that we have built over 120 miles of fiber optic cable infrastructure through Harrison County. This includes both our mainline project as well as several adjoining neighborhoods that had high participation in our interest survey. Because of this, we are now able to provide our services to approximately 10,000 households in the area, and that number will only continue to grow over the upcoming years. The neighborhoods we are currently serving are listed at the bottom of this page. Mainstream Fiber is the only 100% fiber optic to the home internet service provider in Harrison County. We do not stop at the pole or take other half measures; we make sure to provide fiber directly to the home, business, or wherever you need it most, Our service starts at 50 mbps download speed and extends all the way up to 1 Gbps. Beyond that, our service is not, and never will be, subject to data caps or throttling. If you’re interested in getting reliable high speed fiber internet, we may already be available in your neighborhood. Call us at (844) 752 – 6736, check online at msfiber.net, or visit our regional office in Corydon at 2370 Landmark Way to see if you can get signed up today. If we are not already in your area, please take our survey at msfiber.servicezones.net/harrison and encourage your neighbors to do the same. We rely on demand to expand our network, so the most proactive neighborhoods will be connected first. Not only that, but taking the survey ensures that you will be notified the moment construction of our network begins in your area. Join the many who have already completed this step as we continue to grow and expand throughout Harrison County. About Mainstream Fiber: Mainstream Fiber is a locally owned and operated internet service provider, headquartered in Nashville, Indiana, dedicated to bringing high speed, reliable, and affordable internet service to the un-served or underserved communities throughout Indiana. Mainstream Fiber operates independently, completing nearly every facet of providing fiber optic services internally, from construction, to network management, to operations and administration. 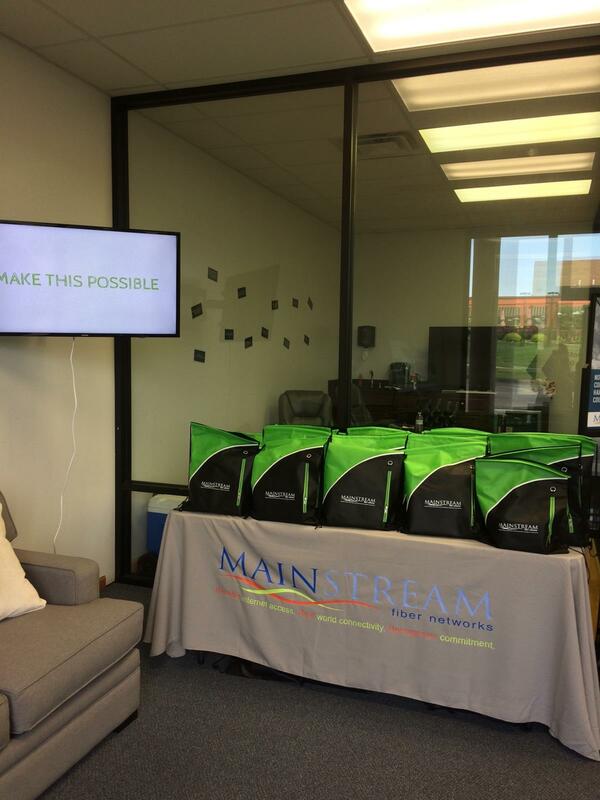 On Wednesday September 5th, Mainstream Fiber Networks held its inaugural Customer Appreciation Day in Harrison County. We decided to hold the event in order to show thanks for all of the Harrison County residents who have been there with us and helped us grow through these past couple years. The event was a resounding success, with dozens of Mainstream Fiber customers coming in to enjoy food, games, and meet with our team. It was a fun afternoon and it was an absolute pleasure for us to meet and talk with all of those who came. In addition, two drawings were held, one for a TV, and one for a pair of $50 Amazon gift cards. The winners of the Amazon gift cards were Jim Curtis and Sean and Lisa Hunchman, and the winner of the TV was Virginia Morris. Congratulations to all the winners! From the bottom of our hearts, we at Mainstream want to thank all of you who participated in the event, and for all of those who couldn’t make it, we hope to see you next year!